Exclusive Interview: "I have always wanted to work in a business I felt was fool proof and stable." Why did you go down the franchise route? And why did you choose your V.I.P. F&HM franchise? I have always wanted to work in a business which I felt was fool proof and stable. I have seen lots of new businesses in Perth and Fremantle come and go and didn’t want to be a statistic. We chose to go down the franchise path as there is a support structure with systems and support set in place. Both myself and my wife Karen, spent quite a considerable time scouring the web for something that we thought we could do together that would bring in a substantial income that would give us a comfortable lifestyle. Some franchises seemed too good to be true and after delving deeper into them we realised they were. You basically get what you pay for. 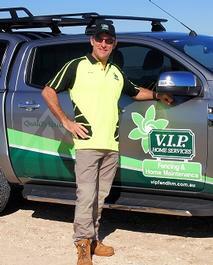 We came across VIP’s new division of Fencing & Home Maintenance which was available in Perth, Karen and I really liked the fresh overall new image and the fact that VIP are a well-known established brand. What did you do before taking up a V.I.P. F&HM franchise? I am a mechanical tradesman and have worked in a variety of different industries. I have travelled extensively with my trade and have also owned my own business building sheds and patios previously. How did you raise the finance? We used money from our offset account in our mortgage to avoid hefty bank repayments. What training and support did you receive initially and ongoing? Initially it was costly for us as we were the only franchisee in Perth, so we booked flights over to Melbourne to meet with the National Franchisors Warren Smith & Vea Johnson. Karen spent a week in the National office to learn the computer systems whilst I joined the trainer and Regional Master, Justin Williams in the field). The weather was typically wet and muddy so I did the best I could in the 2 weeks whilst there. Once back in Perth we have worked hard to build up our business and have had excellent support from Warren & Vea as well as Stratosphere who are the bookkeeping service that is offered through VIP. We have also had to adapt the Perth training manuals to suit our environment here. What is a typical day for you as a V.I.P. F&HM franchisee? My typical day consists of early morning gym session, followed by grabbing my packed lunch (thanks Kaz) and then I hook up the VIP Trailer to head off to the building site. As we are working together on this, Karen follows up with emails with clients and any of the admin work. I will take work leads when I need them and do quotes for prospective customers as soon as I can. As this is a new division in Perth, being the only franchisee was challenging. I have had to learn how to build lots of different types of fences that were not initially covered in our 2 weeks training in Melbourne. Due to my trade background, Kaz’s amazing “can do” attitude (pull the boots on Kaz), and the VIP training manuals, we have gotten through these challenges. Tree roots, rocks, dogs, some council regulations and unruly neighbour disputes have all added to the challenges. Put all these ingredients into the mix and this has been quite an experience. All these things have helped us to grow from these challenges. Has becoming a V.I.P. F&HM franchisee changed your life, if so how? Yes! Each day is different which makes this business exciting and it beats the FIFO lifestyle any day! We can now plan work around our life rather than the other way around. We have a lot of this done for us which is great, as staying on top of this by yourself is near on impossible and is possibly why most new businesses fail within the first 12 months. Our vehicle and trailer signage is free advertising and works very well. We do seek testimonials from all our clients and keep photographic records of my work to build a solid portfolio on our Facebook Page and social media sites. We also seek referrals (seem to be growing well this way) and actively canvass local businesses that would benefit from the list of services I can provide them, this all works well for us. What differentiates your V.I.P. F&HM franchise from the competition? Clean image, excellent training, fantastic and informative social media presence and a genuine commitment to customer service and build quality. Taking pride in my work, being professional, punctual, having the “trust” factor with clients (we are all police cleared), a “can do” attitude, a willingness to follow tried and proven systems and a commitment to always fly the brand flag high. What advice would you give to someone thinking of buying their first franchise? To become a success, you must be prepared to make some sacrifices and learn from those who have succeeded. Make sure you can afford to invest in yourself and research properly. Speak to other franchisees to see how they are travelling and see if they are getting the support that is promised. We are currently building up our franchise business here in the Fremantle area. Eventually we will sell this and focus specifically on helping others succeed here in Perth via our Regional Master Franchise. To request further non-obligatory franchise information V.I.P for free, please complete the short here.